The bankers’ ponzi-scheme – which began with the distortion of free markets in 1694 when the Bank of England began issuing debt-based paper banknotes alongside the Royal Mint’s gold and silver coins – is coming to an end. The bankers’ wildly successful and long-running scheme, dependent on the uneasy equilibrium between credit and debt, has now been irrevocably destabilized. Aggregate levels of debt are now so high that credit—no matter how cheap and available—cannot restore the balance. The Achilles heel of the bankers’ scheme is its need to constantly expand to pay the constantly compounding debts created by capitalism’s expansion and contraction cycles; and as long as growth is relative to the supply and demand needs of the underlying economy, bankers are able to skim off societal productivity in the form of compounding interest, i.e. the bankers’ vig. Soon, they will not be able to do so. Although charging interest is a spectacularly remunerative way to profit, its immorality has been questioned since time immemorial. The Muslim religion still bans the practice although a technical workaround is tolerated. The Catholic Church considered usury a sin and the Torah forbids Jews to charge interest to other Jews, though not to others. Today, the bankers’ run at mammon’s considerable table is in its final stage. 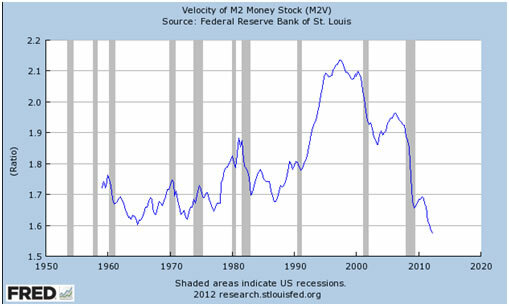 Credit and debt have so distorted supply and demand fundamentals that demand is no longer sufficient to insure the requisite velocity of money; and, without requisite velocity, the bankers’ increasingly sclerotic juggernaut will eventually come to a halt and their time-vulnerable debt-based tower of Babel will come tumbling down. It happened in the 1930s. It’s happening again today. …There may be equilibrium which, though stable, is so delicately poised that, after departure from it beyond certain limits, instability ensues, just as, at first, a stick may be under strain, ready all the time to bend back, until a certain point is reached, when it breaks. This simile probably applies when a debtor [goes] ‘broke,’ or when the breaking of many debtors constitutes a ‘crash,’ after which there is no coming back to the original equilibrium. To take another simile, such a disaster is somewhat like the ‘capsizing’ of a ship which, under ordinary conditions, is always near stable equilibrium but which, after being tipped beyond a certain angle, has no longer this tendency to return to equilibrium, but, instead, a tendency to depart further from it… The more the economic boat tips, the more it tends to tip. It is not tending to right itself, but is capsizing. Irving Fisher (1867-1947), an American economist of considerable repute, is considered the ‘father of monetarism’, i.e. the quantity theory of money, Joseph Schumpeter called Fisher, ‘the greatest economist the United States has ever produced’, an accolade echoed by Milton Friedman. Fisher’s reputation, however, is forever tarnished by remarks made prior and after the 1929 stock market crash. In addition to his credentials as an economist, Fisher was a multi-millionaire, had invested his fortune in the stock market (on margin) and believed without question the markets’ upward direction. One week before the crash, as stock prices became increasingly volatile, Fisher reassured the nervous public the market was merely shaking out the lunatic fringe, that stock prices had achieved a permanently high plateau, that there was no cause for panic; and, after the crash, Fisher continued to tell the now devastated public that a recovery was imminent. Fisher’s reputation and net worth would never recover. Note: In dollar terms, the stock market would not regain its pre-1929 crash valuations until 1954. In 1933, Fisher returned to the study of economics and wrote Debt-Deflation Theory Of Great Depressions, of which the above excerpt is taken. Although not widely disseminated because of his tarnished reputation, it contains the genesis of what today is called quantitative easing, QE. The monetary phenomena of a deflationary depression occurs only after excessive credit creates a speculative bubble so massive its bursting unleashes a powerful vortex of collapsing demand and falling prices into which all productivity eventually falls making recovery impossible. In Debt-Deflation Theory Of Great Depressions (1933), Irving Fisher put forward the idea that by intentional reflation, deflation can be stopped. Fisher’s solution was simple, i.e. that to end deflation it was only necessary to reflate prices up to the level at which outstanding debts were contracted, .i.e. to pre-crisis bubble levels. Fisher’s unorthodox thesis posited that once pre-crisis price levels were restored – the level at which the now unpayable debts had been incurred - economic activity would naturally recommence, a highly questionable theory presented apodictically, untested by precedent and unsupported by evidence. Fisher explained his theory and lack of evidence in this way: ..it is purposely expressed dogmatically and without proof. It does not ..[mean, however,] that I am not ready to modify it on presentation of new evidence. On the contrary, it is quite tentative. It may serve as a challenge to others and as raw material to help them work out a better product. Due to extenuating historical circumstances, however, the beta testing of Fisher’ untried and untested deflation/reflation theory would take place in real time, 75 years later in 2008, when the very stability of the global economy would be at stake. Milton Friedman’s acolyte, Ben Bernanke, was then Fed chairman and would put Fisher’s untested thesis to the test. In November 2008, Bernanke set in motion a highly unorthodox response to the then unfolding 2008 financial crisis, quantitative easing, QE - the unleveraged and non-sterilized purchases of assets and government debt on an historic scale. QE was also compatible with Friedman’s theory of expanding the money supply to reverse a deflationary collapse in demand. Note: The Japanese had instituted a similar and smaller version of quantitative easing in 2001. But the intent was to promote private lending, not to reflate prices. The Japanese later concluded that QE was a failure in that regard. Ben Bernanke was forced to implement Fisher’s questionable theory because, by 2008, the usual answer to slowing growth, i.e. lower interest rates, had proved ineffective in containing the financial crisis and had, in fact, backfired. Ben Bernanke’s predecessor at the Fed, Alan Greenspan, after the 2000 dot.com bubble collapse, had tried to restart the US economy by simply lowering interest rates, from 6.5% to 1%. The low rates, however, unexpectedly fueled a massive property bubble in 2003 - 2006 whose bursting in 2007 led directly to the Sept/Oct. 2008 global collapse. The solution of lower interest rates being inadequate to contain the 2008 contagion, Bernanke was forced to turn to the only remaining strategy in the Fed’s almost empty bag of tricks; and although unproven and untried, it was a nonetheless a solution proffered by his mentor’s, Milton Friedman’s economic icon, Irving Fisher. In November 2008, Ben Bernanke began his purchase of $600 billion of mortgage-backed securities, and by March 2009, the Fed’s holdings of such securities had almost tripled to $1.75 trillion, double the balance sheet totals previously reserved for Treasuries, i.e. $700-$800 billion. The Fed’s explosive purchases of mortgage-backed securities and housing agency debt had nothing to do with the stated goal of increasing employment, the excuse given by the Fed for QE. Despite the trillions spent on QE, the effect on US employment rates was negligible. Note: By purposeful misdirection, the Fed keeps its real mandate hidden. 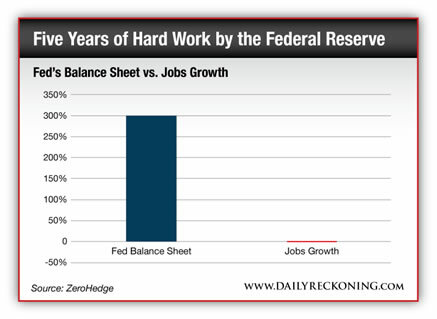 The purpose of the Federal Reserve is not full employment, price stability or even the prevention of economic crises. The real purpose of the Fed is to oversee the bankers’ diabolical and lucrative franchise of debt-based money that has promoted the unconscionable indebting of America and turned its once-free citizens into debt slaves of the few. By massive and unprecedented intervention in the US housing market, Ben Bernanke literally bet the house, i.e. the US economy, hoping the Fed’s massive purchases of mortgage-backed securities would, according to Fisher’s deflation/reflation theory, reflate housing prices to pre-crisis, i.e. bubble, levels, i.e. 2006, and hopefully restore economic equilibrium and growth. Not wanting to divulge the untested and unorthodox basis of QE, Bernanke was hard pressed to justify QE’s high cost considering its minimal effect on employment. Other than forcing interest rates lower and sending cheap dollars cascading into global stock markets creating more bubbles, the effect on the real economy was questionable given the trillions spent. Nonetheless, Bernanke pressed ahead, showing a perseverance and commitment reserved only for those betting other peoples’ money. QE1 (November 2008 – March 2010) cost the Fed’s balance sheet $2 trillion, QE2 (November 2010 - June 2011) added an additional $600 billion and QE3 (September 2012 – present ) by April 2014 added $1.53 trillion to the still growing bill. The undivulged intent of Bernanke’s quantitative easing, i.e. to reflate US housing prices to pre-crisis levels per Fisher’s deflation/reflation theory, was an almost impossible task given the extreme valuations reached at the top of the bubble in 2006. Nonetheless, US housing prices began to revive in 2012 after a protracted five-year fall. 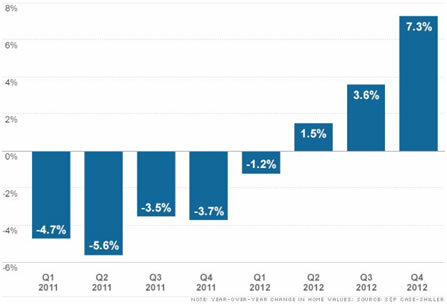 The following chart shows the year-to-year change in housing prices, 2011 – 2012, when real estate prices finally began to recover. Encouraged by the revived housing market, on December 12, 2012, the Fed voted to extend QE3 indefinitely; and, by June 2013, the housing news was even better as the housing recovery was now accelerating. The QE fueled housing recovery gave hope to the promise that Fisher’s deflation/relation theory might pay off, pre-crisis valuations could be achieved and QE would no longer be needed except to maintain price stability if required. On that tenuously hopeful note, on June 19, 2013 Ben Bernanke announced the Fed would taper its bond purchases, i.e. QE, should the recovery continue. But because of the Fed’s purposeful misdirection, Fed watchers, focused instead on employment, saw no reason for Bernanke’s announcement that the five-year flood of Fed liquidity might end. Around the world, liquidity-fueled stock markets fell sharply. Within a week of Bernanke’s announcement, the Dow lost 659 points; and chastened by the negative reaction of global markets, on September 18th the Fed announced any tapering of bond purchases would be delayed. A more cynical view of events would hold that Bernanke knew the chances of housing prices reaching pre-crisis highs were non-existent, that the 2012 housing recovery was driven not by American homebuyers but by the $400 million in monthly purchases by Blackstone Group’s $2.5 billion investment in foreclosed and short-sale homes (Blackstone is now the largest US private real estate owner); and, that Bernanke merely used the good news of the real estate recovery to bail out as Fed chairman while the news was still good. In the fall of 2013, Ben Bernanke announced he would resign. After eight tension-filled years as chairman of the Federal Reserve, Bernanke’s ivory tower hopes that Milton Friedman’s and Irving Fisher’s theories could contain the vast deflationary forces awakened by the collapse of the Fed’s serial bubbles were like America’s patrimony, gone with the wind. In the real world, when excessive credit creates a speculative bubble so massive, its bursting unleashes a powerful vortex of collapsing demand and falling prices into which all productivity eventually falls making recovery impossible. Richard Koo, Chief Economist at the Nomura Research Institute, best known for his study of Japan’s on-going 23 year battle with deflation, in a recent CNBC interview on April 4, 2014, Is the US Caught in a QE Trap? voiced what might be the real cost of QE, i.e. hyperinflation. Koo maintains the US is now caught in a ‘QE trap’. That central banks which instituted QE, e.g. the US, the UK, Japan, etc., must eventually withdraw QE’s excess liquidity or risk inflation rates equal to QE’s expansion of their monetary base. According to Koo, QE has increased the US monetary base by a factor of 19 meaning the US faces a possible inflation rate of 1,900 % unless it finds a way to safely withdraw the massive amount of latent liquidity; something no central bank has ever done or knows how to accomplish. 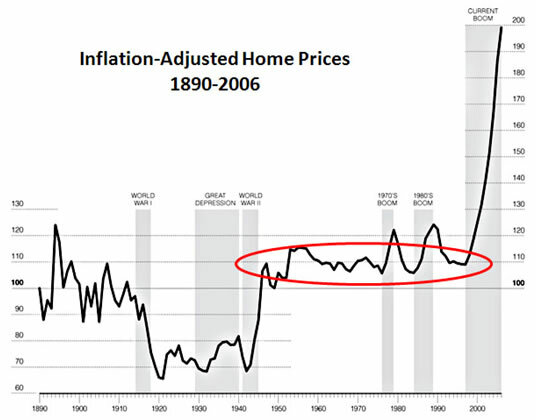 We are facing a deflationary collapse with the additional possibility of hyperinflation. It is not possible to know how the bankers’ debt-based paradigm will end, only that it will; and that the process, whether quick or protracted, will culminate in the complete collapse of the bankers’ ponzi-scheme of credit and debt. Credit-based economies have a systemic bias favoring those closest to the spigots of credit. The inverse is also true, i.e. those farthest away are systemically disadvantaged. This inherent disparity has resulted in today’s highly bifurcated America, e.g. the haves and have-nots in extremis. 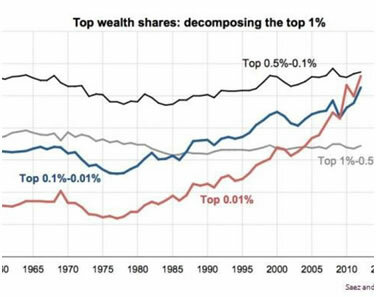 …since 1984, the top 0.1 percent of American households with a minimum net worth of about $20 million have doubled their share of the national wealth from about 9.6 percent to about 21.6 percent. For almost six years, the Fed’s QE driven liquidity has disproportionately benefited the wealthy while dispossessing the middle-class and poor, reflating bubbles in stocks, housing and assets while the rest of America has been increasingly forced to subsist on falling incomes, government assistance and what little trickles down from the top 1-0.1%. Sales of breakfast cereals, canned soups, infant formula, and toilet paper, etc. fell in the US in February. In America, the division between the haves and have-nots is growing. A house divided cannot stand. As Professor Antal E Fekete has long pointed out, the significance of the removal of gold from the international monetary system has not been fully appreciated. Appreciation of its significance, however, is not a precondition for what is about to happen, i.e. the collapse of the banker’s three hundred year-old tower of credit and debt. Unbeknownst to the kreditmeisters, gold was the cotter pin holding their wealth extraction ponzi-scheme together. When Nixon, on the advice of Milton Friedman, cut the ties between the US paper dollar and gold in 1971, he also unknowingly cut the last remaining vestige to any semblance of economic stability. No regime of paper fiat money has ever survived the test of time as time eventually exposes paper money’s fatal flaws. That day is fast approaching for the bankers’ debt-based paper bank notes. In my youtube interview with Ralph T. Foster, Paper Money: An Invitation To Be Robbed, the author of Fiat Paper Money voices his observations about paper money’s vulnerabilities and what this means for those who have put their faith in it, see http://youtu.be/JnfyZx09WIU. In my latest Dollars & Sense video, the subject is Freedom and the Matrix. Like money, the nature of freedom, reality and the matrix is even more opaque and even harder to understand, see http://youtu.be/kTlFeKptzO0. The bankers’ debt-based paradigm is in its final days. After the collapse, your patience will be rewarded. Gold’s day is coming.